The medieval period of English history is often romanticized. There have been a myriad of movies of the period and people attend renaissance festivals in attempts to reenact the period, and people often build castles out of LEGO, so a book combining the two makes perfect sense. 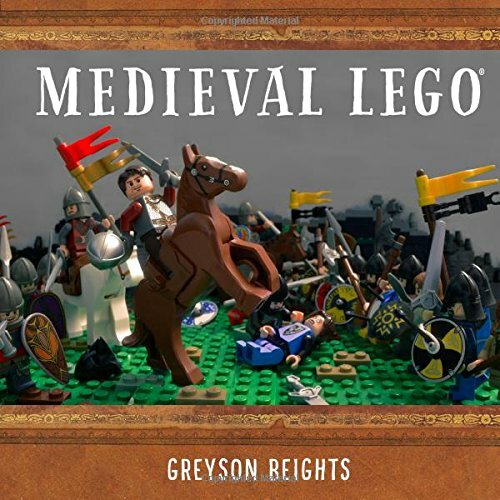 Medieval LEGO by Greyson Beights from No Starch Press brings it all together to be a simple history book illustrated by LEGO creations. The book is organized in chapters that are 4 pages each on average. They give a cursory overview of the topic – like William the Conqueror, Robin Hood, William Wallace, and The Great Famine – each written by a professor who have a level of authority in the topic, as stated in their biographies at the back of the book. Since each topic only gets a couple pages, it’s the most barebones information about each topic and doesn’t give a good amount of history, just barely the amount of information you would learn in the first paragraph of a wikipedia article. The LEGO building in the book doesn’t fare much better. Most of the pictures are macro photography of minifigures with either plants or the barest of LEGO building in the backgrounds. Most of the builds are built by other builders, but with few exception it doesn’t feel like they built much. The biggest mystery to me is why Greyson Beights is listed as the writer of the book when it looks like he didn’t actually write more than the introduction. The short historical pieces are all written by professors and all the LEGO creations are built by someone else. It feels like he didn’t do much more than pick the topics and assign the work – so is he really an author or just an editor? Uninispired LEGO building and the barebones history really made this book fall short for me. I had high hopes because I knew there was a wealth of information and interest in Medieval LEGO and interesting LEGO builds out there, but neither of those appear to have made it into this book.